UTIs are painful and frustrating. And can lead to accidents in the house. 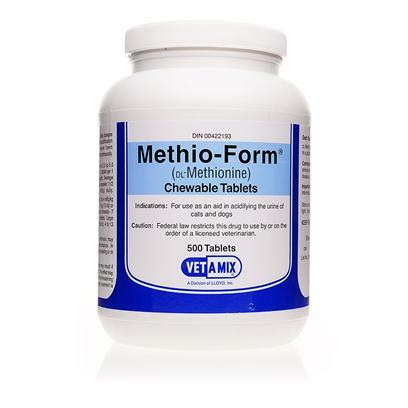 Help your pet avoid them with Methio-Form. Methio-Form is an FDA-approved prescription medication used to treat and prevent certain types of urinary stones in both dogs and cats. This easy-to-administer remedy can help prevent bladder stones and urinary tract infections. Side effects may include loss of appetite, nausea, vomiting, or diarrhea. If your pet exhibits an allergic reaction (symptoms may include swelling, hives, itching, difficulty breathing, etc. ), contact your veterinarian immediately. Methio-Form may cause Heinz body anemia in cats. The symptoms of this include tiredness, weakness, pale gums, difficulty breathing, loss of appetite, and heart murmurs. If you notice any of these symptoms in your cat, contact your veterinarian. Not for use in animals with liver disease, pancreatic disease, kidney failure, metabolic acidosis, or urate urinary stones. Do not use in kittens. Tell your veterinarian about any medications, vitamins, supplements, aminoglycoside antibiotics, or quinidine that your pet is taking, as interactions may occur. Do not combine Methio-Form with diets that acidify urine unless recommended by your veterinarian. Follow the directions provided by your veterinarian. The usual daily dose for cats cats is ½-1 tablet per 2.5 to 3 pounds of body weight. Average size adult cats will normally receive 1 ½-3 tablets daily depending on the cat’s weight. The usual dose for dogs up to 15 lbs is ½-4 tablets, for dogs 15 to 33 pounds give 2-7 tablets, and for dogs 33 to 66 lbs give 4-13 tablets.